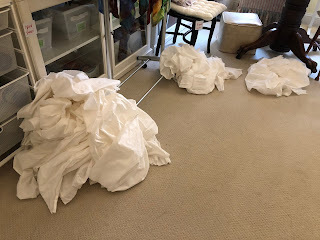 Studio Jules Art - Blog: Getting Ready for a Busy Dye Weekend! Getting Ready for a Busy Dye Weekend! I made a wonderful trip to United Notions/Moda yesterday and bought fabric to dye and other needed items to sell and for the Studio. Today, I'm washing all the PDF (yes, I wash Prepared for Dyeing Fabric) and sorting it into size sections. 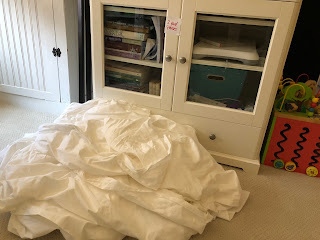 Most of the fabric will be for ice dyeing, but one bolt is designated for Shibori dyeing. And yes, the piles are labeled and I just pray, no one comes in and messes them up. Oh, why do I wash Prepared for Dyeing Fabric? Because I know there are probably still starches and other things in the fabric, plus I don't like that crease down the middle. The crease doesn't come out with just a rinse and dry, it has to be washed out. Fun days ahead! What's on your weekend plan? Do You Schedule Your Week?